Profile: Needlenose was once the most renowned microchip designer on Cybertron. His "Chic Chips" line of computer hardware accessories became the fashion rage of its day. But, as with most fads, interest in Chic Chips eventually waned. Its disappearance was hastened when some of the more serious-minded Transformers, led by Optimus Prime, pointed out the frivolous nature of Needlenose's enterprise. Embittered by this experience, Needlenose gladly joined the ranks of the Decepticons when they began their war with the Autobots. He has since developed the reputation of being the coolest Decepticon ever to crush an Autobot. But he is more interested in the style in which he destroys Autobots than in their actual destruction. In fact, he is so fashion-conscious that he rarely finds the time to even participate in battle. This is particularly true when he is on Earth, where he is especially fascinated by the latest in human fads. His current favorite is video games. Needlenose is binary-bonded to the Nebulans, Zigzag and Sunbeam. Zigzag was an unhappy hovercraft repairman on Nebulos. His inability to properly use a laser welder made him particularly ill-suited for his job. Usually the vehicles that he was assigned to repair were worse off after he worked on them. His fellow workers ridiculed him for his ineptitude. They derisively called him "Ziggy" rather than his real name. 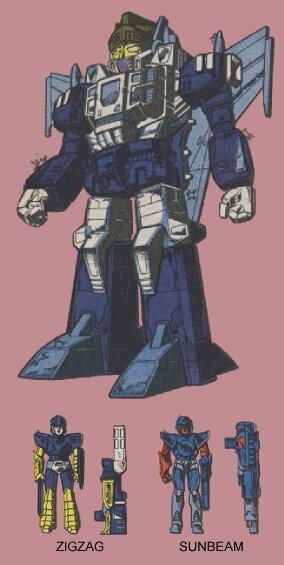 Seeing an alliance with the Decepticons as a way to get even with his tormentors, he eagerly offered his services to the leader of the Nebulos-based Decepticons, Scorponok, who happily accepted him into the ranks of his warriors. After putting him through the bio-engineering process, Scorponok paired him with Needlenose. The Nebulan gave himself the code name "Zigzag," which he thought sounded strong and put an ironic twist to his insulting nickname. However, the Decepticons soon found his services to be as wanting as had the Nebulans. Sunbeam was an irresponsible beach bum on Nebulos before he discovered the Decepticons. His greatest ambition was to go rocket-surfing on the 50-foot tall waves that occurred annually on his home planet's Magna Beach. But, having accomplished that, he needed new challenges. So, for the opportunity to rocket-surf on other worlds, he joined the Decepticons and underwent bio-engineering. He was then paired with Needlenose and trained in aerial combat. He views the warrior aspect of his job as a necessary nuisance. He says, "If I have to scrap a few 'Bots so I can ride the Mercury Breakers on Cybertron, well like, hey, no problem, dude." Abilities: Needlenose transforms into a fusion-powered fighter jet. His maximum flying speed is 2400 miles per hour, and his range is 4000 miles. He is equipped with air-to-air proton missiles. Zigzag transforms into a twin electrostatic overloader rifle, which can disable a mechanical opponent by flooding his circuits with a surge of electricity, causing him to overload and shut down. Some of his victims even explode. However, Zigzag's accuracy is poor, so most targets escape unscathed. Sunbeam converts to a solar-powered light-burst discharger. A flash from his muzzle causes temporary blindness in all opponents except those whose optical modules are properly shielded. Needlenose can use Zigzag and Sunbeam in robot and jet modes. The two Nebulans can also combine to form a single weapon, which retains the offensive capabilities of both its components. Weaknesses: Zigzag often runs out of energy before he hits a target. Sunbeam's firepower is diminished in situations when the sun isn't shining.